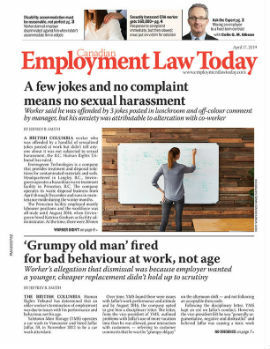 A British Columbia employer has been ordered by a jury to pay more than $800,000 in damages for wrongfully dismissing a long-term employee. Larry Higginson had worked at a sawmill for Babine Forest Products in Burns Lake, B.C., for more than 30 years when the sawmill was sold to Portland, Ore.-based Hampton Lumber Mills in 2006. Higginson continued to work at the sawmill until October 2009, when he was fired. Hampton claimed it had just cause for dismissal and didn’t pay Higginson any severance pay. Higginson sued for wrongful dismissal, claiming the just cause for dismissal was made up as a way to avoid paying his severance, which would be significant given his length of service. A three-week jury trial ensued in June and, in the end, the jury found Higginson was wrongfully dismissed. Hampton Lumber Mills and Babine Forest Products — joint defendants in the trial — were ordered to pay $236,000 in damages for Higginson’s wrongful dismissal. The jury also found the companies were liable for $573,000 in punitive damages for the way in which Higginson was terminated. The decision represented the largest punitive damages award in an employment law case in Canada, according to TevlinGleade, the law firm representing Higginson.